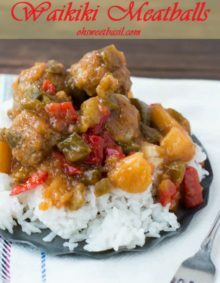 Could I do these in the slow cooker? Yes absolutely! 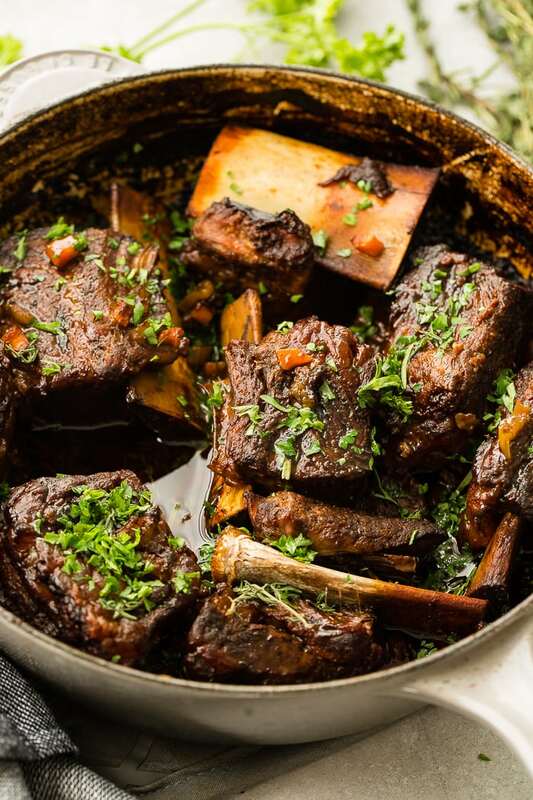 You will still want to brown your short ribs on the stove top first. Then you can cook them in the slow cooker on low for 4-5 hours, no longer than 8. Enjoy! I followed the recipe and opted for cooking in the oven for 3 hours. It smelled so good while cooking and was looking forward to the short ribs. Greatly disappointed when I saw that the liquid had burned off and charred the bottom of the dutch oven. The meat had stuck to the char and became short rib jerky. Not sure what I did wrong but I’ll try it one more time. I may add more beef stock and cook for only 2 1/2 hours versus 3 hours. Any suggestions would be appreciated. Oh no!! The only time I’ve had an issue with them overcooking is when I didn’t have the full 4 lbs of short ribs. Also, every oven cooks a little differently, so I would start with maybe 2 hours and 15 minutes since yours overcooked so badly. Fingers crossed on your next attempt! They really are so dang good! I don’t like rosemary, do you know any other herb I could use beside this one? Hi Cindy! You can omit the rosemary and double up on the thyme, or use any other herb that you enjoy…sage or parsley would be yummy! You made my day Sabrina!! I have been working so hard on taking better photos. And way to get creative and make it work! So glad it was a hit for your family! Thank you for the feedback and great tips! Are there really 117 g of fat per serving?! That seem outrageous! Let me double check that. We’ve been having issues with our nutrition calculator. Thank you! 375 was far too high a temp for braising. All my liquid evaporated and burned at the 2 hour mark. And no, my oven does not run hotter. Braising should be done at a temp between 250 & 325. Good and I added that. 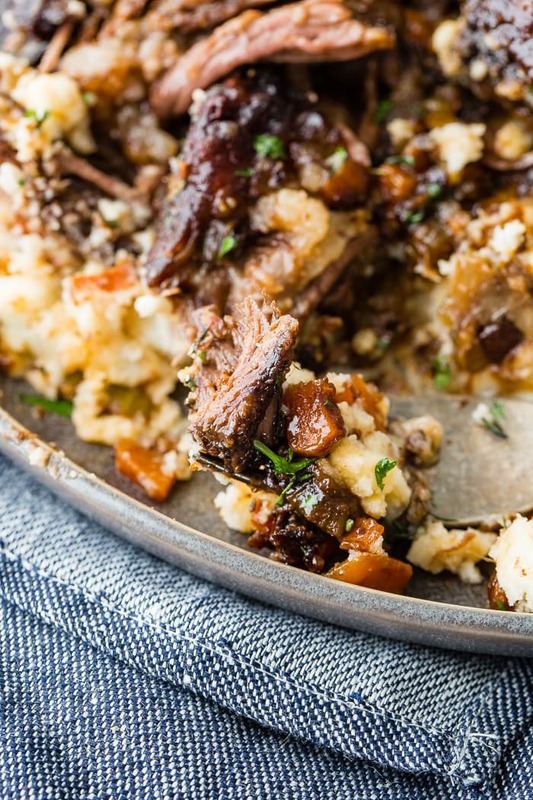 This was our favorite short rib recipe so far! Masking it again today! Thank you Kat! Like I said, it is my absolute favorite right now! Enjoy it again! My liquid does not cover all the ribs. Is it supposed to? Nope, it doesn’t need to cover them. Have you ever made this in something other than a Dutch Oven? Crock Pot? We haven’t tried cooking it any other way yet. Hi. 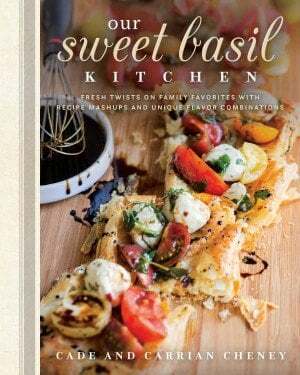 I am an avid Cook and have made numerous yummy recipes but this one knocks it out the park. It was absolutely FANTASTIC and is now one of my top 5 favourites. Thank you so much for posting!! Please please tell me that the carb grams were not correct on the braised short ribs. 101 carbs? Our nutrition calculator has been acting up so I will check that. Thank you! Any update on the carbs? Yes, the recipe card has been updated. It says 36g now. Thank you Kim! 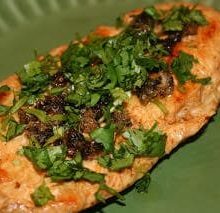 My husband said I knocked it out of the park with this recipe I will say I put in some dried morel seasoning mix into it but this is a fantastic recipe I highly recommended! Yessss! Way to go Vicki! And thank you! Absolutely delicious and definitely restaurant quality! The whole family loved it, even my picky 7 and 12-year-old. My only question would be, how much of the fat do you trim away before searing the ribs? I took the largest excesses off but it was still quite fatty in the end. I’m wondering if I should have been more thorough prior to cooking?? I usually don’t trim any of the fat off. If they are super fatty I would trim them down to just a thin layer. So glad you enjoyed it!! 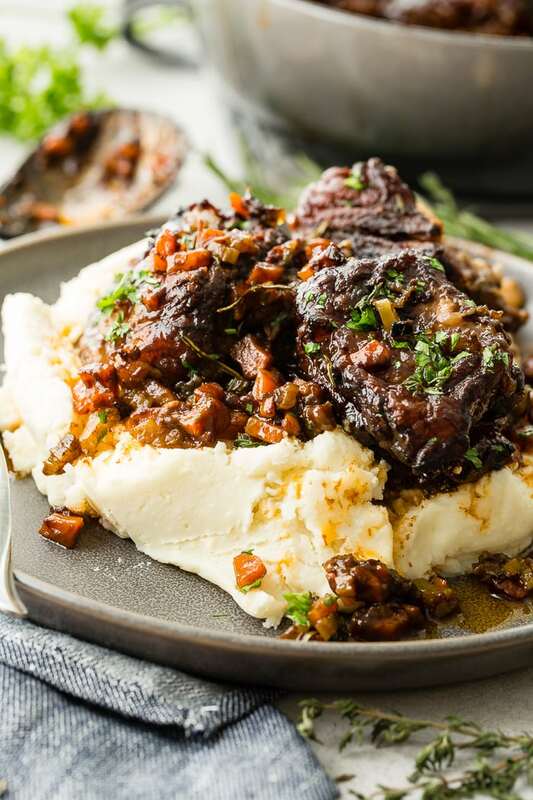 Just made these last night and I have to say that they were the BEST short ribs I’ve made so far. They were restaurant quality. Loved the fact that I didn’t need red wine to make them. Look forward to making them again! Thank you. Aren’t they are so dang good?! So glad you enjoyed them! Holy Smokes. The BEST short ribs I’ve ever made. I eat 90% but once a week I’ll make a near meal for my husband. He almost always request short ribs. I’ve made so many recipes. This one is amazing. I can’t wait to have company over for this one. It is my favorite thing to serve guests lately! It is always a hit! So glad you enjoyed it Julie!! Liquid smoke is not available in Australia, what can be used in its place? Or omit??? You can get it at Barbecues Galore. I’m making this tomorrow. One question: in your story prior to the actual recipe, you mention the gravy containing onions, but there are no onions in the recipe itself. I’m guessing you added a diced onion in with the carrots and celery, correct? Bahhhh! Where did those onions go? I’m updating the recipe now. It should have 1/3 cup of minced onions that you add with the celery and carrots! Thank you Leslie! Enjoy tomorrow!! Why is the oven pre heated if all of the cooking is done on the stove top? Step 11 in the instructions is in the oven. I added it so that was clear! Thank you for bringing that to my attention! Am I missing where that Tblsp of flour goes? Made this for a family gathering – it was delicious! Thanks for the feedback Deborah!! Happy New Year! Boy, you were not kidding! This recipe is so delicious! I could not find bone-in short ribs and had to buy boneless, but they still were very flavorful and tender. Thank you for sharing the recipe, it is a keeper! I’m drooling right now just thinking about it! I’m so obsessed! Thank you for sharing! 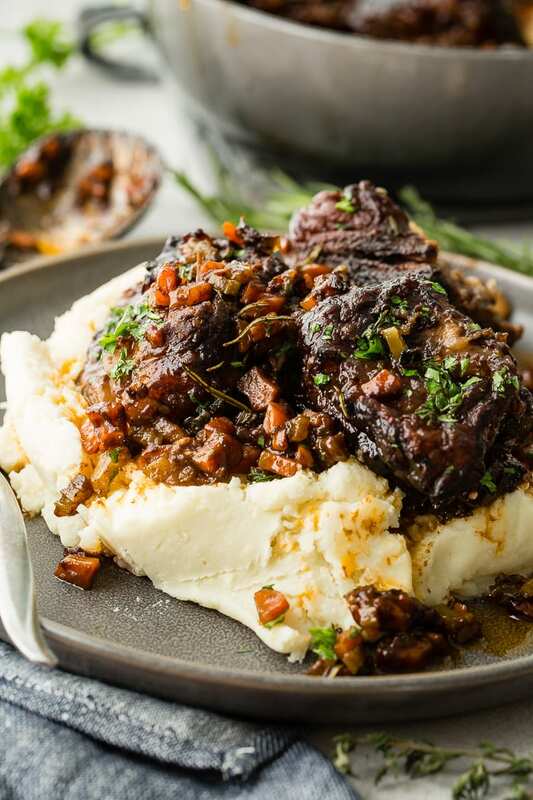 Did you shorten the cooking time when using boneless short ribs? What is the second half of the butter and the 1 tbls of flour for? In the oven now. So excited! It’s to make a thickening agent called a roux. Sounds delicious. So you cook them in the oven? Recipe says cook for 2-3 hours but does that mean put them in oven or on stove top? Yes in the oven at 375 degrees. I’ve recently started making short ribs in the crockpot. I use a pot roast cook in bag and cook it on low all day. It turns out so tender that it also falls off the bone and it’s so juicy. 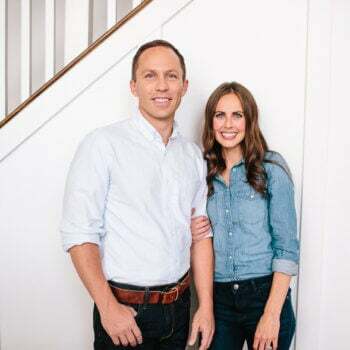 Both myself and my husband are very picky eaters and don’t have anything to do with fat on meat. Cooking it this way the fat all cooks down and creates the juices. It’s something that I make at least once a month. 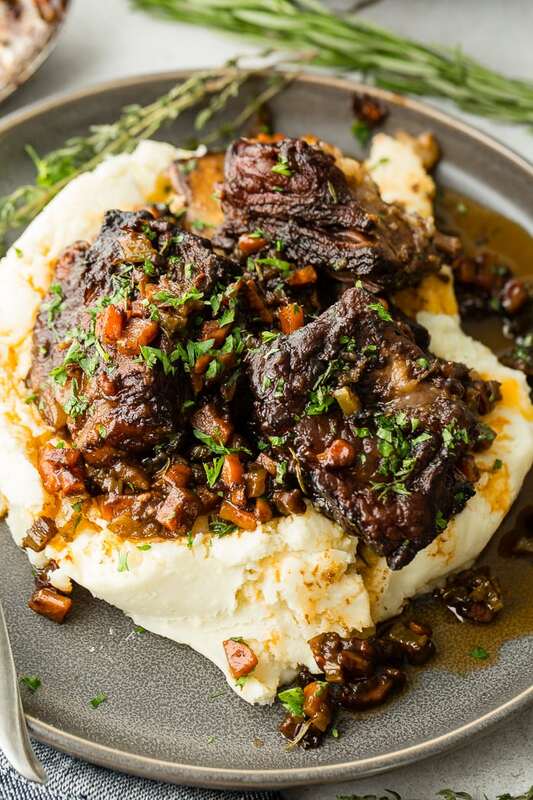 Aren’t short ribs so delicious?! Now my mouth is watering! Haha! 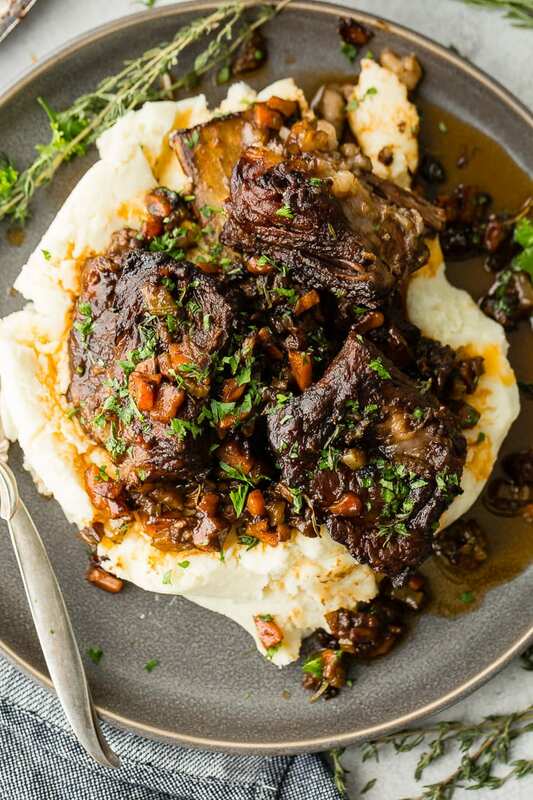 Beef short ribs can be expensive so you can substitute meaty beef shanks if you find them less expensive than ribs. 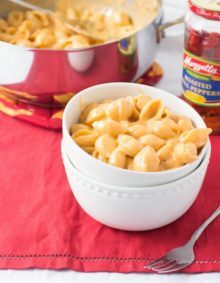 No need to change this recipe at all, it is a great one!